Happy Birthday Louise Brown, the world’s first IVF baby! Louise is 35 today and we were delighted to welcome her back to help unveil a plaque to commemorate the work of our founders, IVF pioneers Patrick Steptoe and Robert Edwards. 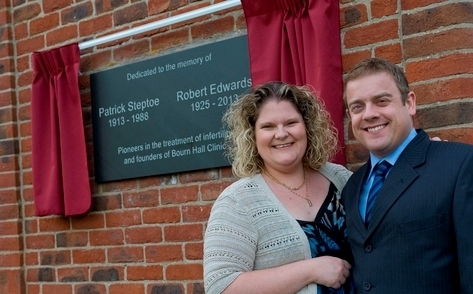 Louise unveilled the plaque jointly with Alastair MacDonald, the world’s first IVF boy, and his mother Grace, Professor Edwards’ wife Ruth and his daughter Jenny and staff from Bourn Hall who worked with Steptoe and Edwards. Grace MacDonald got in touch with Steptoe and Edwards after she read their research paper in The Lancet and volunteered, like hundreds of other women, to take part in their work. It is now estimated that around 5.5 million babies have been born worldwide as a result of IVF – a legacy all of us at Bourn Hall feel immensely proud of. Find out more about the history of IVF and Bourn Hall here.